Over the last decade, it has become standard for virtually everyone to carry a camera in their pocket. Sure, your cell phone might not take the most impressive pictures in the world, but they’re pretty good for taking everyday shots. Unfortunately since most phones are touchscreens these days, it’s really hard to tap the spot that controls the shutter. Some phones do have a dedicated button on the side, but even that can be hard to reach, depending on how you’re holding it. What’s worse is that when you do try and hit the button, you often move the whole camera, resulting in a blurry shot. What if you were able to control the camera from another simple device? 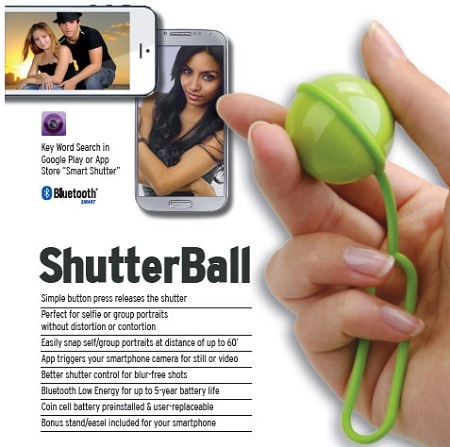 The ShutterBall is a simple gadget that controls the shutter on your Android or iOS device. It connects via Bluetooth, so it can be used up to 60 feet away. Since it’s shaped like a small ball, you can cup it in the palm of your hand as you pose for your next profile pic, and give it a squeeze. Or, you can set your phone down, if you want to be in a group shot, and with a click, make sure that you’ve got the perfect photo. The ShutterBall uses a coin cell battery, and has a 5-year battery life. Unfortunately we do not currently have information on pricing or availability.